Discoveries of prehistoric jewelry at ancestral Zuni villages inspired a revival of mosaic work in the 1920’s. The updated technique utilized silver backing rather than wood or shell. Modern mosaic work features an array of stones and shell from around the world. The artist designs the overall form and then individually cuts each stone to fit tightly with the other stones in the piece. Another type of mosaic work, called overlay inlay, features two pieces of silver, one for the backing and the second, with a pattern cut from the silver, soldered on top. 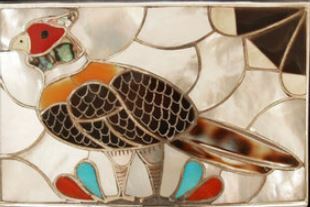 Rather than leaving the silver empty as in Hopi overlay, zuni artists fill the opening with stones laid in to form a mosaic design. Channel inlay is a variation of mosaic inlay. The artist creates soldered silver compartments within the backing. Cut stones fitted within the compartments create repetitive geometric designs or figurative pieces. The compartments strengthen the integrity of the many stones within a mosaic piece and provide an added design element. 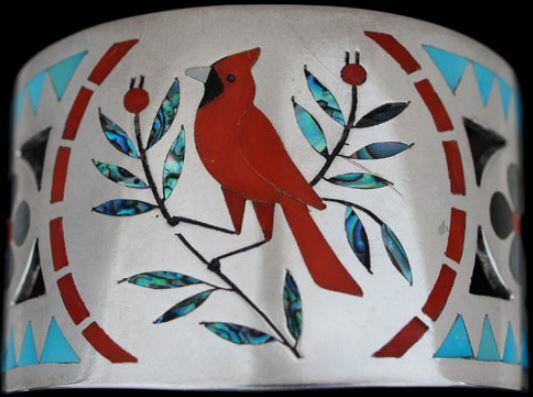 Since ancient times, the Zuni people have used fetish carvings for protection and blessings. Originally carved from stones found near the pueblo or from traded shells, early fetish jewelry consisted of simple stone and shell necklaces which might contain several animal fetishes or a single animal pendant.